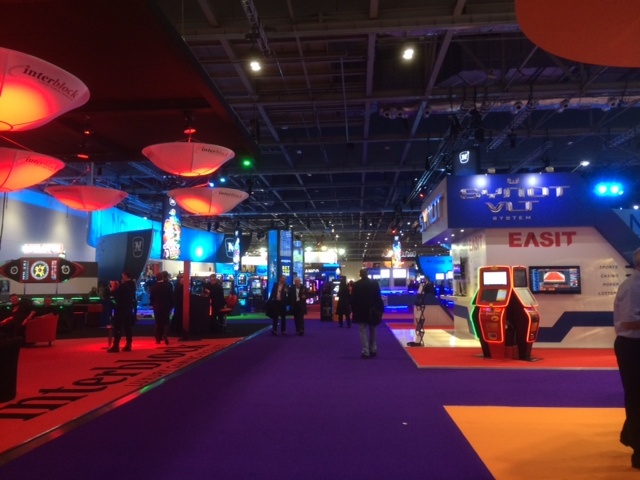 The ICE Gaming Expo, London. Last week I went to the ICE Totally Gaming Expo at the Excel exhibition center in London. This gigantic international gambling expo payed host to a full day of Bitcoin seminars with speakers ranging from casino operators and technical games developers to marketeers and regulatory and government officials. However, Bitcoin’s bigger gift to the industry may lie in the concept of ‘provably fair’ gaming, a buzzword that came up more than once. In a nutshell, block chain technology can be used in online games to verify inputs and outputs, this allows gamblers to see that a game is fair. Whilst this is just catching on in the gambling industry, it is not to the Bitcoin community. Satoshi Dice, brainchild of Erik Voorhees, pioneered the concept of provably fair online gaming back in 2012. Satoshi Dice was a hub for Bitcoin activity in the early days of the currency and sold in 2013 for 126,315 BTC (about $11 million). Why then, with so much potential in Bitcoin, was there such a small crowd this year compared to last? Well, a couple of concerns kept re-emerging that were best explained by Jiten Melwani, CEO of Bitgamelabs in his talk ‘Risk Management in Bitcoin Sports Betting’. Firstly, the gambling industry has to contend with professional gamblers or ‘sharp’ betters as they are known, and Bitcoin may make this job a little harder. About 1% of gamblers are professionals, a small but significant number, who are able to continually profit from the system. Where FIAT accounts are used, limits can be applied to the number of accounts held by sharp betters. However, when dealing with Bitcoin, the same person can hold any number of accounts, due to the pseudonymous nature of the currency. There’s no way to hold back the sharp better. Secondly, regulation. The gambling community already work extra hard to gain a good standing with authorities, as you can imagine the reputation of the industry often precedes it. Therefore they are having to weigh up the volume of Bitcoin transactions that they will realistically do at the moment with the risk involved in navigating relatively new territory. Many are simply waiting for regulation before proceeding. It was therefore refreshing to hear from Mustafa Yilmaz, director of Princess Star Casinos who told the room about how he proudly accepts Bitcoin across his global chain of land-based casinos. The crowd quizzed him about the risks to which he looked non plussed, as far as he was concerned it was a no-brainer, and so far a completely positive experience. Following the talks, I had a great demo from Softswiss, sponsors of the seminar, whose ATM’s, in collaboration with Cubits and Amatic, allow you to top up eGaming accounts. I concluded that attitudes to Bitcoin in the gambling industry are more to do with the type of person you are. Do you carefully hedge your bets or do you, like Mustafa, find it perfectly reasonable to ‘go all in’. I know what type of person I am but let me leave you with this thought. In chatting to an acquaintance recently, who wrote his masters thesis on Probability, I learnt that betting everything on one number of the roulette wheel in the first game gives the greatest chance of success, more so that any other strategy.